The 2005 American Gold Eagle Coins returned mixed results for the bullion coin mintages while the Proof Eagles proved more popular than in the previous year. Undoubtedly factoring into the bullion coin uncertainty was the fact that gold was continuing its trend of annual increases that started back in 2002. This was after the precious metal bottomed out at $271.04 an ounce in 2001. Each successive year up to 2005 (and beyond) saw some improvement. Gold traded in the $410-$450 range for the first eight months of the year before showing improved numbers the last half of the year. Once completed, 2005 gold ended up with an average of $444.74 an ounce. 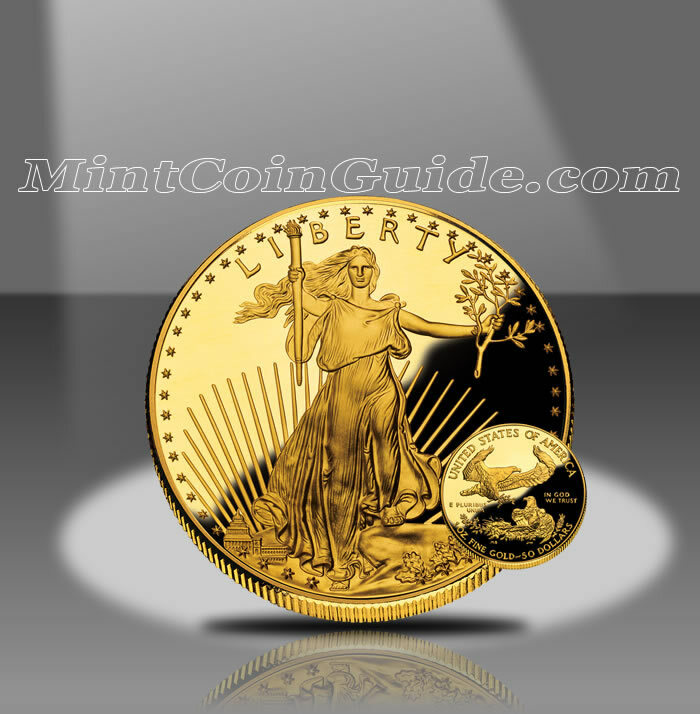 Bullion Eagle mintage saw large decreases for the two largest sized coins – one ounce and 1/2 ounce. The 1/4 ounce Eagle remained relatively unchanged while the smallest 1/10 Eagle ended with a 50,000 coin increase. Proof Gold Eagle mintage saw significant improvement across the board, including the 4-Coin Sets. The chart below shows the total mintage of 2005-dated Proof Gold Eagles which includes the number sold as part of the Gold Eagle 4-Coin Set (of which 25,461 were sold). The 2005 Gold Eagles were the twentieth annual version of the strikes which began in 1986. Bullion Eagles were available from the Mint’s network of authorized purchasers for most of the year. Proof Gold Eagles were available starting on January 13, 2005, much earlier than the Mint had released them in previous years. Proof Gold Eagles once again saw price increases from the Mint owing to the improving gold market. Accordingly, in 2005 the US Mint charged $720 for the One Ounce Eagle, $360 for the 1/2 Ounce Proof, $190 for the 1/4 Ounce Proof, $95 for the 1/10 Ounce Proof and $1,260 for the 4-Coin Set. Bullion Eagles were sold by the Mint’s network of authorized purchasers for a small premium above the current spot price of the gold contained within them. The US Mint’s facility in West Point was responsible for for striking all of the Proof Gold Eagles. Consequently, each Proof has a ‘W’ mintmark. Lady Liberty is featured on the obverse (heads side) of the Gold Eagles. The design was the work of Augustus Saint-Gaudens, which he originally created for the 1907-1933 Double Eagle Coin. The reverse (tails side) was designed by Miley Busiek and shows a male eagle soaring above the family nest.